Manchester like Glasgow, Liverpool and London is regarded as one of Britain’s musical cities. That has been the case for over fifty years. During that period, Manchester has always had a vibrant, thriving and eclectic music scene. One man who has been a familiar face on the Manchester music scene is reed man Chip Wickham. He spent the two decades of his career in Manchester, working with some of the leading lights of the city’s music scene. During that period, Chip Wickham established a reputation as one of Manchester’s top jazz musicians. Then in 2007, Chip Wickham decided to head to sunnier climes. Madrid became home for Chip Wickham. For the next six years, he was a familiar face on the city’s music scene. Especially, within Madrid’s soul-jazz scene. Later, Chip changed direction, and began fusing raw funk with Latin music. This proved popular, and soon, Chip was recording two singles for the Madrid based label Lovemonk. Then in 2013, Chip was on the move again. Next stop was Dubai, which has been his home to Chip Wickham ever since. However, when the time to record what would become his debut album La Sombra, Chip returned to Madrid. La Sombra, which is the long-awaited and much-anticipated debut album from Chip Wickham, will be released on Lovemonk on 20th January 2017. However, Chip’s career began twenty-five years ago in Manchester. Before embarking upon a musical career, Chip Wickham had spent time studying in Manchester between 1988 and 1992. During that time, Chip often made the journey along the M62 to Leeds, where he was a familiar face in the jazz and funk clubs. By the time his student years were over, Chip’s interest in music had grown to such an extent that he was ready to make the transition from spectator to participant. Not within Leeds’ thriving and vibrant musical scene. Instead, Chip Wickham was ready to participate in Manchester’s vibrant music scene. This was the of era of Acid House, Factory Records, the Hacienda and as the nineties dawned,the Madchester era. Manchester was regarded as one of the most important musical cities in the world. Almost en masse, critics and cultural commentators headed to Manchester.They were determined to document the rise and rise of Manchester. This resulted in musical tourists beating a path to Manchester, in search of the music they had read about. Within Manchester, numerous disparate music scenes coexisted happily. This included the UK hip hop and breakbeat scene. Manchester was at the heart of the UK hip hop and breakbeat scene. Many labels had sprung up, hoping to cash in on rise in popularity of the UK hip hop and breakbeat scene. One of the more established labels was Grand Central Records. They were looking for an in-house session musician. Manchester flautist and saxophonist Chip Wickham fitted the bill. He was ostensibly a jazz musician, but was versatile and seemed to be the perfect person to accompany Grand Central Records’ enviable roster of artists. From 1996 onwards, Chip Wickham worked with artists signed to Grand Central Records. Over the next few years, he worked with AIM, Rae and Christian, Fingathing, Veba, The Pharcyde, QnC, YZ and Supernatural at Grand Central Records. This allowed him to continue to hone his sound, during what was akin to a musical apprenticeship. Chip learnt about the various aspects of production, and also, made important contacts within the music industry. This lead to Chip Wickham working with some of the top British producers, including Nightmares On Wax, Graham Massey of 808 State, Jimpster and Andy Votel. Soon, Chip was touring with some of the biggest names in music. One of the biggest names Chip Wickham worked with was veteran vibes man Roy Ayers. Later, Chip Wickham would work with fellow Mancunian, Badly Drawn Boy. Around this time, Chip met another Manchester based musician, trumpeter Matthew Halsall. They became firm friends and Chip would later, head out on tour and record with Matthew Halsall. Meanwhile, Chip was always in demand to play live or on sessions. In June 2003 Chip Wickham got the opportunity to work with one of the biggest names in British music, Badly Drawn Boy. Just like Chip, Badly Drawn Boy was a familiar face in the Manchester music scene. He had released his debut album The Hour Of Bewilderbeast in 2000. Three years later in June 2003, Badly Drawn Boy was preparing to record his third album One Plus One Is One. Chip was brought onboard to play on five of the tracks. One Plus One Is One was released in 2004 and was one of the highest profile and most successful releases Chip had played on. By 2004, Chip Wickham had worked on everything from breakbeat and hip hop to deep house, downtempo and indie. Working with such a wide variety of artists and producers ensured that Chip became a versatile musician, who could seamlessly switched between musical genres. This ensured that Chip was always in-demand to play on sessions or head out on tour with a variety of artists. Despite this, Chip decided to head for sunnier climes in 2007. Chip Wickham decided to head to another city with a thriving musical scene, Madrid. Having settled in the city, Chip’s electronic Latin band Malena, released their much-anticipated debut album, Fried Samba later in 2007. This was somewhat overdue. Chip Wickham, Daniel Broad and Susana Montero had been releasing successful singles as Malena since 2000. However, Malena had never gotten round to releasing an album. Somewhat belatedly, Fried Samba was released to critical acclaim in 2007. It was we’ll worth the wait. By 2008, Chip Wickham become a familiar face within Madrid’s music scene. Especially within the soul-jazz scene. He worked with Gecko Turner, Speak Low, The Sweet Vandals, Siete Pulgadas, Ann Sexton and Luz Casal. However, after a while, Chip changed direction musically, and began fusing raw funk with Latin music. This resulted in Chip releasing two singles on the Madrid based Lovemonk label. The first single, Feelin’ Alright, was released in 2009. Chip Wickham’s fusion of raw funk and Latin music proved popular. So much so, that in 2011, a second single was released, Hit and Run. Stylistically, it followed in the footsteps of Feelin’ Alright. Just like its predecessor, Hit and Run proved successful. It also came to the attention of Craig Charles. He invited Chip Wickham to join Craig Charles Fantasy Funk Band. It featured the creme de la creme of the British soul and funk scene. This included James Taylor of the James Taylor Quartet, Snowboy and Mick Talbot who was once a member of The Style Council. They now plied their trade with the Craig Charles Fantasy Funk Band. Chip was about to join some of the top musicians from the British soul and funk scene. He didn’t look out of place. Far from it, the fifteen years he had spent playing professionally made Chip a welcome addition to the Craig Charles Fantasy Funk Band. So much so, that he improved their already impressive sound. For Chip this was the start of a new chapter in his career. In 2013, another chapter in Chip Wickham’s career came to a close, when he left Madrid. Next step was Dubai. It became his base as a new chapter in his career began to unfold. After three years living in Dubai, Chip was living when he began to think about recording his debut solo album. This was the one thing he still had to do. As Chip Wickham thoughts turned to his solo album, he realised this was the perfect opportunity to revisit the music that had influenced and inspired him, jazz. Especially the jazz music that his heroes Roland Kirk, Yuseef Lateef and Harold McNair had produced. This would very different to the jazz, funk, soul, hip-hop, Latin and electronica that Chip had produced over the past three decades. Having decided to record a jazz album, Chip Wickham wrote six tracks, La Sombra, Sling Shot, Red Planet,The Detour,Pushed Too Far and Tokyo Slow Mo. The other track that Chip decided to cover was La Leyenda Del Tiempo. It was penned by Federico García Lorca and Ricardo Pachón Capitán and would eventually close La Sombra. After writing and choosing the music that would feature on La Sombra, Chip Wickham decided to record the album in Madrid. He booked Red Led Studios for the recording sessions. This made sense, as he would be working with Spanish musicians. So Chip Wickham started looking for musicians who would feature on La Sombra. Eventually, he settled on a quartet. Joining Chip at Red Led Studios, in Madrid were a rhythm section of drummer and vibraphonist Antonio Pax and David Salvador on double bass. They were augmented by pianist Gabriel Casanova. Chip would switch between tenor saxophone, flute and alto flute. He also arranged and produced La Sombra. Once the album was complete, Chip mixed his long-awaited debut album La Sombra. Once the album was complete, Chip Wickham took the album to the Madrid based Lovemonk label. They had released the two singles Chip released in 2009 and 2011. Six years later, they would release Chip’s debut album La Sombra on 20th January 2017. It’s an album that Chip’s been working towards for twenty-five years. Straight away, Sling Shot transports the listener back to the late-sixties. There’s a funky sound to the bass that propels the arrangement along. Soon, it’s joined by the drums, vibes and piano. This brings back memories of Dave Pike. Before long, Chip’s saxophone joins the fray, and soars high above the arrangement. It drops out, but soon returns, locking into a groove with the piano and vibes. They become one, as the rhythm section power the arrangement along. Later, the vibe and piano crete a hypnotic backdrop as Chip unleashes braying, blazing solo. When it drops out, the bass and then piano enjoy their moment in the sun. So briefly, do the vibes, before Chip returns as the arrangement breezes joyously along. Then as Sling Shot reaches its crescendo, Chip passes the baton to vibraphonist Antonio Pax on this memorable and joyous track. slow things down. Soon, the momentum builds as the rhythm section and piano lock into a groove. Meanwhile, Chip unleashes a masterclass on the flute, playing with flair, power and control. Then the baton passes to pianist Gabriel Casanova. His fingers dance across the keyboard, music flowing through his as a drum pounds and cymbal crashes. Later, Chip returns and again, plays with power and control producing a chirping sound, as the rest of the band drive the track to an impressive crescendo. Drummer Antonio Pax counts the band in on The Detour. At first, it’s just the rhythm section that play. That’s until the vibes and piano enter. The vibes make a brief appearance before the flute enters. Again, Chip’s playing with power, control and determination. He drinks air deeply into his lungs, before expanding energy and passion as he plays. It’s a truly committed performance. When the flute briefly drops out, the piano, vibes and drums all enjoy their moment in the sun. Soon, Chip returns, playing with the same power, commitment and energy. After he gasps, the flute soars and rasps as Chip reaches new heights. Meanwhile, the rest of the band take their lead from Chip, and lock into a hypnotic groove. Rolls of drums, glistening vibes and a walking bass accompany Chip as he unleashes a powerhouse of a performance. It drops out, just before the track reaches its crescendo. By then, one can’t help but marvel at a fully committed powerhouse of a performance by one of Britain’s top jazz musicians. There’s a wistful sound to Pushed Too Far. The rhythm section play slowly as the piano adds a mesmeric backdrop. Meanwhile, the alto sax adds a thoughtful, sometimes dreamy sound. It’s joined by the vibes, and they remain as the alto drops out. This allows the rest of the band to showcase their considerable skills. When he alto returns, the arrangement is slow, understated and meanders along and continues to unfold. Still, it’s a beautiful, thoughtful and cinematic track that continues to tug at the heartstrings. The tempo stays slow, on Tokyo Slow Mo while the arrangement is spacious. Just the rhythm section, vibes and piano combine before the sultry saxophone enters. It hangs lazily in the air, as the bass wanders and the piano adds a mesmeric backdrop. As the piano seesaws, the sultry saxophone glides along, while the drums are played softly and bass plucked gently. Later, when the saxophone drops out, the glistening vibes enter and play a starring role. However, they exit stage left before the lazy, sultry saxophone returns. It adds to track that has veered between thoughtful, melancholy and hopeful. Always, though, beauty is omnipresent on Tokyo Slow Mo. An urgently plucked bass opens La Leyenda Del Tiempo, which closes La Sombra. Soon, the drums join the piano. It’s played with a similar urgency. So is Chip’s flute. Again, he plays with power, hungrily drawing air into his lungs so he can unleash another powerhouse of a solo. He combines speed and power, but is always in control. Even when the flute soars way above the arrangement. It then drops out, and piano takes centre-stage. Buoyed by Chip’s performance, Gabriel Casanova fingers fly across the keyboard, as the rhythm section match him every step of the way. It’s an impressive performance, that brings back memories of jazz’s heyday. Especially, when Chip returns briefly. He basses the baton to bassist David Salvador who ensures the track and indeed, La Sombra ends on a high. 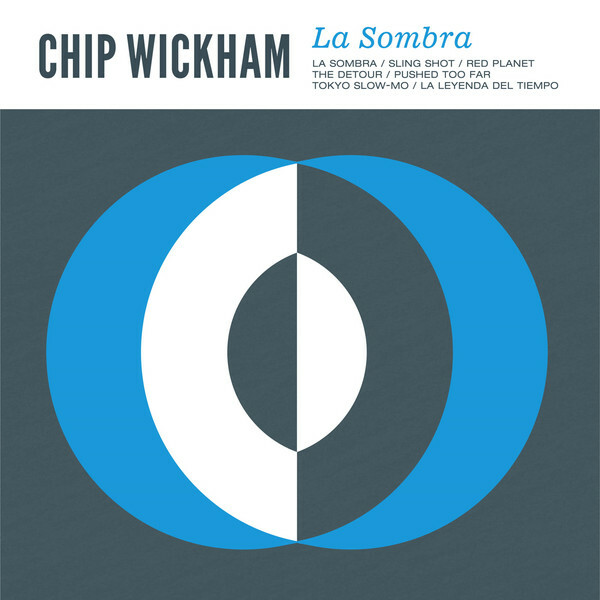 After seven tracks lasting just over forty-six magical minutes, Chip Wickham’s long-awaited debut album La Sombra is over. It’s taken Chip twenty-five years to get round to recording La Sombra, but it’s been well worth the wait. From the opening bars of La Sombra to the closing notes of La Leyenda Del Tiempo, Chip Wickham never miss a beat. That’s no surprise. Chip put together a tight, talented band that feature some of Madrid’s top jazz musicians. They showcase their considerable talents on La Sombra, which will be released on the Lovemonk label on 20th January 2017. Sometimes, when the tempo increases on tracks like Sling Shot, Red Planet and The Detour, and his band enjoy the opportunity to kick loose and play with a freedom. Then when the tempo drops on Pushed Too Far and Tokyo Slow Mo, the band play slowly and thoughtfully on tracks where beauty is omnipresent. Always, Chip Wickham and his give nothing less than 100% as they draw inspiration from and pay homage to some of the giants of jazz. Among the artists who have influenced Chip Wickham, are Yusef Lateef. The influence of his early albums can be heard on tracks like La Sombra and Pushed Too Far. Then on Sling Shot and Red Planet, immediately one thinks of the music Freddie Hubbard released for Blue Note. However, for much of La Sombra, the jazz of the late sixties and early seventies seems to be the primary influence for Chip Wickham. That is no surprise. Jazz was Chip Wickham’s first musical love. He grew up listening to his heroes Roland Kirk, Yuseef Lateef and Harold McNair. Alas, it wasn’t jazz that Chip ended up playing. Instead, he spent three decades, playing funk, soul, hip-hop, Latin and electronica. After these dalliances with various other genres, Chip Wickham realised the time had come to return to his first love. After twenty-five years apart, Chip Wickham realised the time had come to his return what was first love, jazz. Chip Wickham was reunited with jazz on La Sombra. It’s the long-awaited and much-anticipated debut album of one of Britain’s top reed men, Chip Wickham, who showcases his considerable talents of La Sombra. ← LEONARD COHEN-YOU WANT IT DARKER.